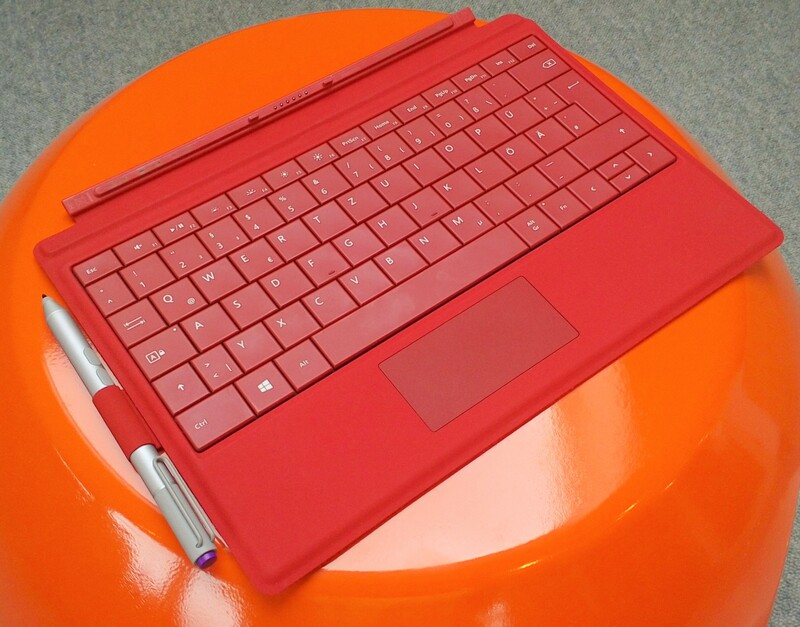 The Surface 3 is the little brother of the Surface Pro 3. It comes not only with a smaller screen of 10.8-inches but also it is cheaper and less powerful than the Pro 3. The processing is high-class and with the magnesium-alloy body it feels very nicely and fits to the Surface line. The device has a kickstand like the other Surfaces which is adjustable in three positions. In my opinion three positions are enough. I don’t need a kickstand like the Pro 3 has, which is continuously adjustable. So (beside the new Microsoft logo on the back) from the outside the devices look quite the same. Only the size is different. Inside though, there is a big difference. 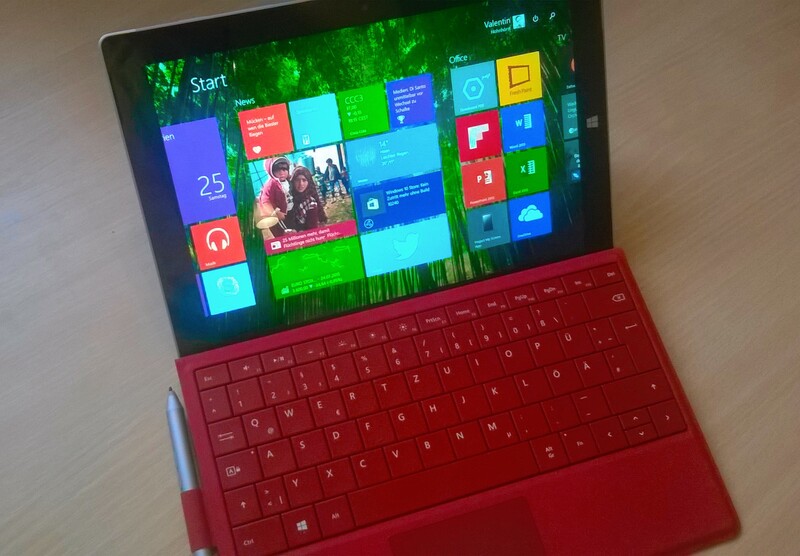 The Surface Pro 3 comes with Intel Core i3, i5 and i7 processors, the Surface 3 only with an Intel Atom x7 processor. Still, Microsoft is promoting the Surface 3 as a tablet that can replace your laptop. I think that this tablet can replace a laptop for typical office use in a brilliant way but not a laptop for video rendering or other tasks, which need much power. I use the Surface 3 more as a laptop with the Type Cover. It is a good keyboard and the feedback of the keys is ok. It works well in protecting the full HD display. In my point of view everyone who wants to buy a Surface needs the Type Cover; don’t get me wrong, the Surface is a very good tablet. But first with the Type Cover you can get the ‘real’ Surface feeling. The Type Cover is available in many colours (red, black, cyan, purple and dark blue) so everyone can find one he likes. Maybe not every colour is available in every market. One reason for buying the Surface 3 was the Surface Pen. With the pen you can write on the display. It is great for writing a short text for example at school or university. The writing experience is better than I thought: It feels like you are writing on paper. I can definitely recommend the pen. The target group of the Surfaces in general are people, who need a device for work or school. You can use the Surface 3 for entertainment like watching videos, listening to music and taking photos with the 8 megapixel camera and the 3.5 megapixel front camera. The Surface 3 can do all these tasks, but keep in mind that the Surface is more a productivity device than a device for entertainment. If you only want a tablet for entertainment the Surface 3 is quite expensive and there are many competitors which are cheaper and can do the same things. If you search for a device for replacing your laptop or a device which is used for working and entertaining the Surface 3 is a great device. Especially since the device is running Windows 8.1 which is good in making the split between work and entertainment. In addition you will need the Type Cover for replacing a laptop which costs $129.99. In my opinion this price is too high. The Surface Pen costs $49.99. If the Surface 3 would include the Type Cover and the pen for a price of $599 (64GB, 2GB RAM)/ $699 (128GB, 4GB RAM) I would be 100% satisfied. Microsoft Lumia 640 Review – Everything you need!